It was a night of unease and my restlessness sprang from the loss of a musical genius for whom I wanted to do an obit. His passing away at 72 reminded me grimly of earlier obits I had done for greats like Miles Davis and Frank Zappa but that was in the print era. Music proliferation was absolutely limited. Also getting latest vinyls of new artists or tapes were next to impossible as India hardly had any reputed music stores. I wonder if they still keep great or latest stuff! Thanks, finally, to online music availability, new releases and Youtube et al. It is not always easy to pen a tribute for a musician and a highly acclaimed and eclectic virtuosic one such as John Abercrombie. I must have been around 16 yrs or so when a dear schoolmate and diehard music junkie Pankaj called me over to his place and as always played this master craftsman’s debut album TIMELESS (The album was recorded on June 21-22, 1974 and released in 1975 via ECM&nbs p;records label). In those days I was high on acid rockers and the musicians like Hendrix, Morisson, Jimmy Page, Ian Anderson, Deep Purple among others who had entered my bloodstream. The moment I heard Abercrombie strum his chords that beautiful summer afternoon, I knew a refreshing era had dawned on musical landscape. In the album he paired with the finest keyboardist Jan Hammer (ex-Mahavishnu Orchestra) alongside modern drummer Jack DeJohnette (he played a sideman for Miles, Keith Jarret and Herbie Hancock, Billy Cobham and Michael Brecker among other jazz giants). The John Abercrombie combo went a long way in bringing a distinctive sound and direction not only to avant-garde jazz but to other existing genres. John Abercrombie, shining alumni of the Berkley School who had the perfect blend of smoothness, speed and versatility that I found was missing in each guitarist I had heard till then. He must’ve been the fastest guitarist I had heard and certainly incomparable in his skill. To sum it up: “John could go anywhere – rhythmically, melodically, harmonically – at the drop of a hat,” said drummer Jack Dejohnette who had close musical association with him for over 40 years. In TIMELESS we find the real genius of Abercrombie. In 1996, Boards of Canada used samples of ‘Timeless ‘for the track “Everything You Do is a Balloon”. Abercrombie is now playing on our home page with this tribute at: fnbworld.com His legacy will be hard to carry on. An obsessive chef. An Indian restaurant in London. And lots of spice!The canvas comes to life in Cheeni Kum with a perfectionist chef-restaurateur, Amitabh Bachchan instructing his team of men-in-apron the art of turning out the world’s finest Zafrani Biryani! Indeed, the delicacy tempts your senses and you wish to instantly tuck into a plate of fragrant Hyderabadi Zafrani Biryani . The latest potboiler from Bollywood’s kitchen, Cheeni Kum promises to be a great treat for both cinema and food lovers alike! It is a pleasant reminder that Indian cuisine is popularly savoured even by the English people (read Indian curry with rice, chicken tikka masala and seekh kebabs to name a few). A mistakenly sweetened Zafrani Biryani, London’s rainy weather and an umbrella catalyses the romance between the lead artists, Amitabh and Tabu. Directed by C. Sreeram, Cheeni Kum is a candid love story between two mature people with an age-gap of three-decades. The master chef, Big B ultimately concedes the flaw in his restaurantâ€™s Biryani when it is pitted against the perfect one made and sent for him by Tabu. 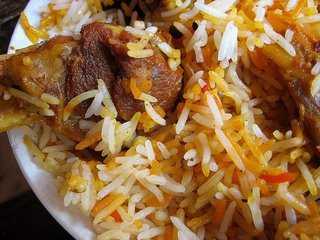 How does one prepare a sumptuous Zafrani Dum Biryani, a delicacy especially crafted for and loved by the royals of Awadh? Read on for the recipe… Zafrani dum biryani/Ingredients: Servings for 2 A) Basmati rice- 400 grams B) Yoghurt-50 grams D) Lime juice- 1 lemon C) Pinch of Saffron D) Cloves E) Whole black pepper F) Cardomom G) Salt to taste H) Whole green chillies. contact: Chef Amitabh Bachchan at Jalsa, Mumbai. All Rights Reserved. Right Impact Media Inc.